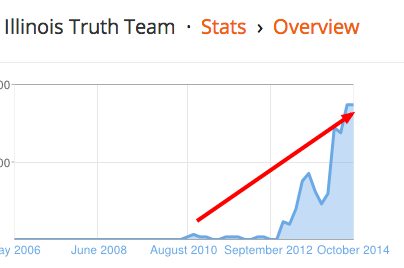 With 10+ days to go in the month, we're pleased to report that traffic to the Illinois Truth Team has just hit our 'high water mark'. We've already surpassed the total traffic, sessions, visits, and pageviews for the month of September and we have 10 more days to go. Thanks to all of you readers who keep tuning into our coverage. We'll be sure to stay on top of all things Illinois politics in the remaining couple of weeks until the November 4th General Election.